I'm going to be completely honest before I start gushing about the cute. I love tiny things, adore tiny foods, and love good food well made. It just delights me, well-made tiny foods are a joy to look at it and to eat. Tiny Food Party! 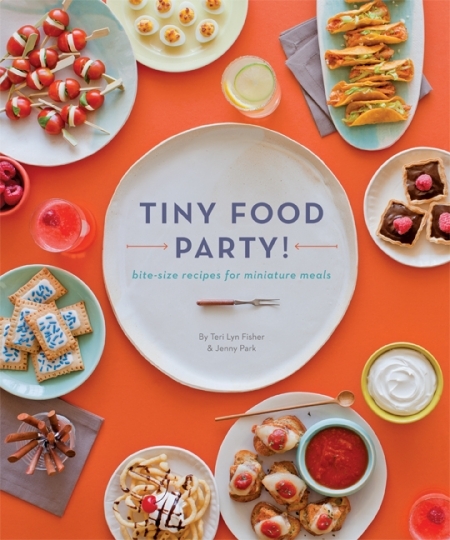 -Bite Sized Recipes for Miniature Meals by Teri Lyn Fish and Jenny Park is full of tiny, appetizer 1 and 2 bite versions of regular food. While the focus is on making things small, there is also a strong focus on making them well so they are as delicious as they are cute to make for truly impressive appetizers. A lot of the recipes could also be used in bento style lunches, tea party foods, or even a full meal for a dinner party which allows guests to try several different things. The photographs are wonderful, the colors are bright and cheerful and the instructions are clearly written with American style volume measurements. A few of the recipes use common convenience ingredients, but most of them are made from scratch. The recipes have a nice gourmet/foodie flair with details and flavors like mini churros made with candied bacon in the batter and suggestions for 3 different dipping sauces. Here's where I start squealing and clapping. Because those recipes? Are fantastic, clever and incredibly tasty. Shallots in a light, perfect batter to make tiny onion rings, perfect mashed potatoes piped in rosettes on tiny Shepard's Pies, miniature eclairs! If you look at the cover, you can see the little Caprese skewers with a Balsamic vinegar glaze. Under that are miniature toaster pastries. That recipe comes with a few suggestions for filling so you could make them to suit almost anyone's tastes. One of my husband's favorite recipes, except for size (he feels like a giant when he eats tiny food) is the Country-style Eggs Benedict, I love that recipe too because instead of a Hollandaise sauce it uses a cheesy/garlic sauce that's a lot easier to make and that tastes fantastic. There are also cocktail recipes for the adults. Little tiny mixed drinks served in shot glasses with gourmet twists and details to make them special and not just a miniature version of a grown up drink. Like the Bloody Marys use a Korean rice wine instead of vodka, and the glass is rimmed with bacon bits. It's a flavorful, spicy, gorgeously garnished mini drink. Adults with a sweet tooth will enjoy the Orange Creamsicles drinks with the honey and sugar garnish. The authors worked small in very clever ways, and this is one of my favorite cookbooks this year. There are menu suggestions for various party themes, and lots of dessert recipes to go with all the main course and side dish recipes. The end of the book includes equivalencies for people using metric, and a good index to find things quickly. Published by Quirk Books, you can find recipes and templates HERE.